Pop Culture Shock Collectibles is proud to announce the Mortal Kombat Klassic ‘Kintaro’ 1:4 scale statue based on his appearance from Mortal Kombat 2. This masterfully created collectible stands 21” tall, has a cloth costume and a Certificate of Authenticity. This PCS ‘Bloody’ Exclusive features everything from the ‘Shokan Roar’ Exclusive but with a Klassic dose of Mortal Kombat blood! – Includes Switch Out Alternate Roaring Head and Switch Out Fists! After the jump you can see the new photos. Kessler Wolf – From an American Werewolf in London. We’ve gathered a nice assortment of images from are team at the event, so join us after the jump to check out the full assortment of PCS awesomeness! In this weeks newsletter, Pop Culture Shock has shared images for a few items that will be on display at New York Comic-Con 2015. Along with the previously revealed Street Fighter V Cammy Statue, they will have both their Princess of Power Hordak Statue and their Mortal Kombat Klassic Kintaro Statue on display. They’ve provided previews of the fully painted statues ahead of the show. Check back later this week as we bring coverage from the PCS Toys booth at the show. Read on to see the previews. Street Fighter – Cammy Statue – Painted and ready for dsiplay. 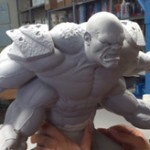 Mortal Kombat Klassic – Kintaro Statue – Still in progress. 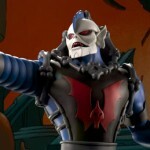 Princess of Power – Hordak Statue – Final painted head sculpt shown. In the latest newsletter, Pop Culture Shock has shared two new teasers. One is for a new Street Fighter Cammy Statue. The image gives us a look at the in-progress statue base, which uses them symbol from her hat. The second is for a Mortal Kombat Klassic Kintaro Statue. This is still an in-progress sculpt. They’ve also been sharing a few Kintaro pics on Instagram.